Alvechurch’s alcohol-free zone has been reprieved amid confusion over its legality, the parish council heard. Grassroots leaders are urging the people of Alvechurch parish to get involved with the creation of a Neighbourhood Plan. Police are appealing for witnesses to a car crash in Alvechurch in which a man was badly injured. The alcohol-free zone may be removed from the centre of Alvechurch. DOUBLE YELLOW lines are to be painted outside the schools in Alvechurch to stop dangerous parking, the parish council heard. Moving the goalposts . . .
Blackwell may have to move its goalposts to solve the problem of unwanted football matches being played. Lickey and Blackwell Parish Council agreed unanimously on the piece of land on Greenhill, Blackwell, as the site for a proposed affordable housing project. A new car park is still being considered to solve poor parking outside Tesco at Marlbrook, Lickey and Blackwell Parish Council heard. Barnt Green Parish Council is preparing for the financial implications of a possible battle with Banner Homes and Bromsgrove District Council over plans for 88 homes at the foot of the Lickey Hills. Major planning decisions affecting Alvechurch have left parish councillors scratching their heads. Shops in the centre of Alvechurch have been urged to encourage their customers not to drop litter – and to clean up after them if they do. The nuisance of “rail squeal” as trains turn the bend into Barnt Green has been eased, the parish council heard. Alvechurch Baptist Church is opening its doors on the mornings of December 9 and 16 to anyone who wants to see it as it is before it undergoes a £160,000 building project. Would-be vegetable growers may soon by able to sign up for allotments in Alvechurch. Hopwood: Where’s our traffic calming? HOPWOOD residents have asked why they are missing out on traffic calming measures. 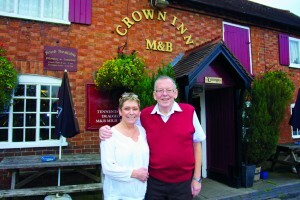 Tricia and Dave Fisher say goodbye to The Crown Inn, Withybed Green, after running it for the past 26 years. They have sold the lease, but will still be living in the area. ‘We’d like to thank all of our fantastic customers,’ said Tricia. Barnt Green Parish Council has warned a proposed 330ft wind turbine close to the village centre would be like having “Big Ben in your backyard”. 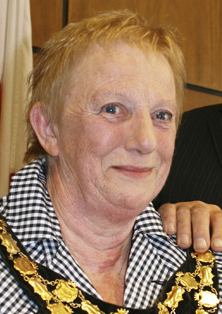 The county councillor for Alvechurch has revealed how she was the victim of a “horrible” incident in a Redditch supermarket car park, leaving her fearful of going out alone. June Griffiths (left) spoke out to warn other villagers to be aware when putting their PIN into cash and self-service machines.